Did you know that the term “onboarding” comes from the HR department and refers to new hires acquiring necessary skills and knowledge in order to effectively join the company as a new employee? It eventually changed its meaning to refer to new users who needed necessary knowledge in order to use a new product like a web or mobile app. The reason we stress over design is because we want to present the product in the best possible light. If the impression is bad then a user is unlikely to come back and recommend the product to someone else. If the user is not impressed, indifferent to the experience, that means there is room for improvement. On the other hand, if the user is impressed by what they experience they are much more likely to come back and enjoy the product again. Good user experiences are the only experiences with longevity. There are many things that could affect a good user experience. This can range from making a complex interface friendlier to gamifying the product from the get go. One of the things that fascinates me is the number of products that require a user to hand over their email address in order to use the product — get the email so you can harass a user who hasn’t returned in a while! They must have forgotten how much they loved us! — Is this the best experience we can come up with? If a user doesn’t want to come back no amount of email nagging is going to change their mind. Let’s give them an experience to successful that they return on their own. 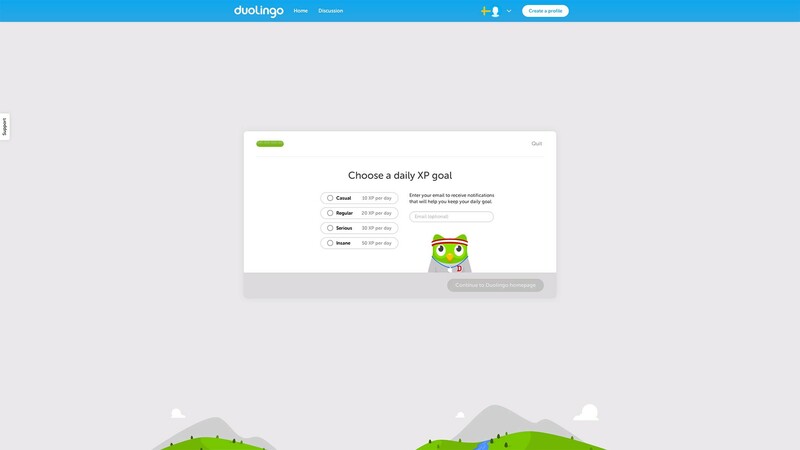 I fell in love with Duolingo’s onboarding, because like many successful onboarding experiences, they allow you to use the app without signing up beforehand. (They recently redesigned, but I like these old designs better.) The experience is all about the user, their wants and needs. 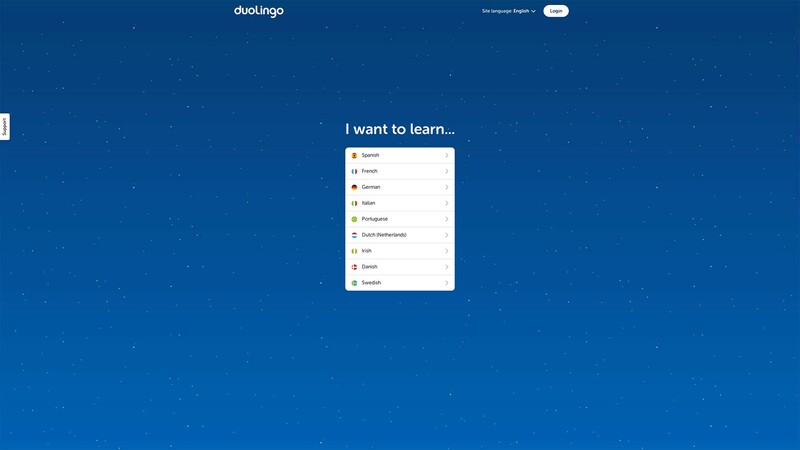 After clicking the “Get Started” CTA you’re posed a proposition in first-person language: “I want to learn…”. It’s personal, and it’s relevant. 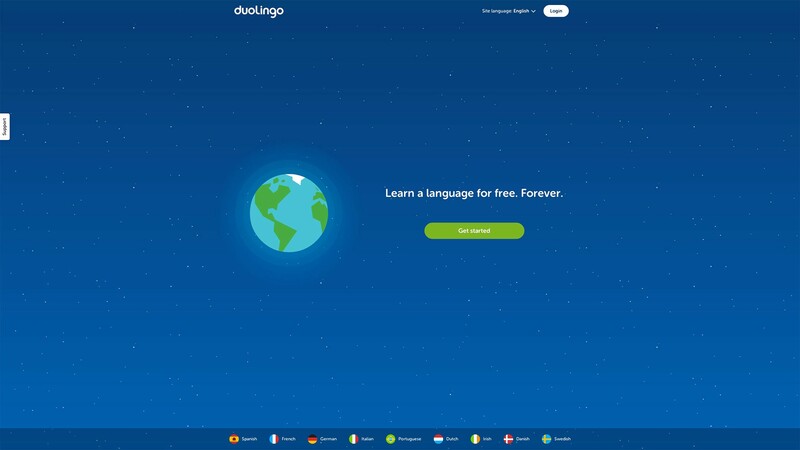 Once a user picks a language they are shown how the app works in four simple steps. While the user is learning about the app there is a lot of positive reinforcement: the progress bars may be short, but they fill up quickly; the bottom of the model turns green with “Good job!” written inside; the continue button is green. Everything is nice and lovely and oh so positive. This may be overkill when you start to analyze it but I don’t see many apps praising me this much for using them. Or going through their walkthrough, for that matter. When a user is introduced to the app, they are actually using it. Think about how powerful that is, and how rarely it is used. Instantly a user can be proud of their accomplishment of writing a quick sentence in a foreign language. 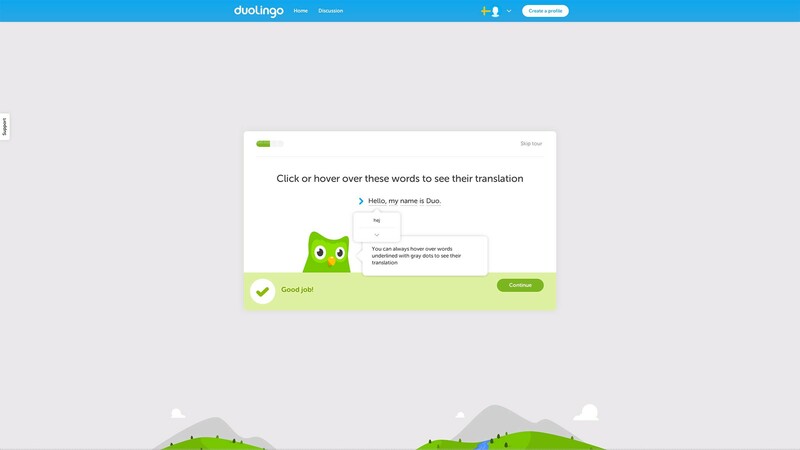 And, once the sentence is submitted there is more positive reinforcement for a job well done: at that point Duolingo knows you either love it or hate it, and if you love it, this is the perfect time to get you started with the app by getting your email. If you don’t care to use Duolingo, no harm done. 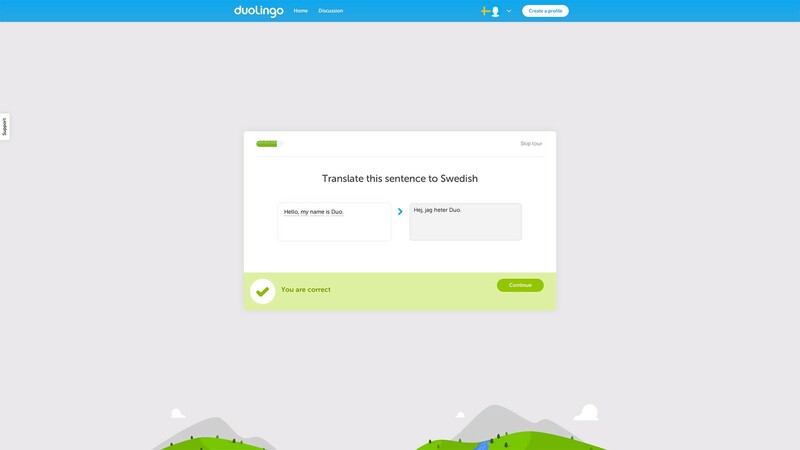 Having the user pick a commitment is a clever way to get them to commit to learning a new language. Well played Duolingo, well played! 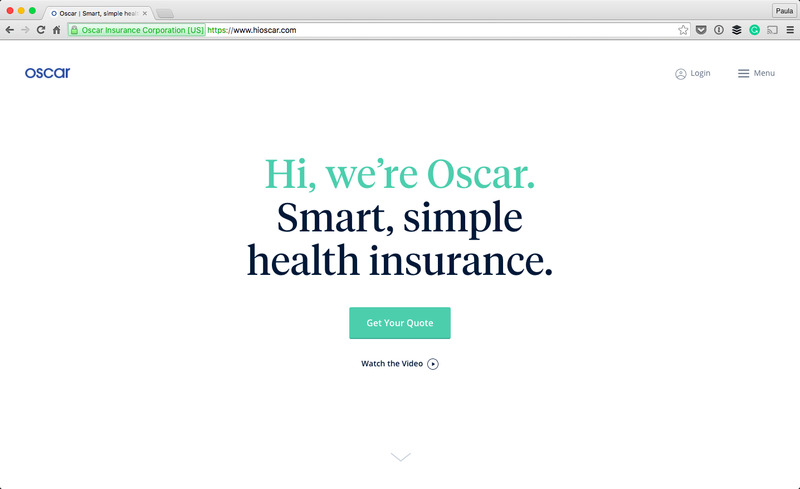 I’d like to walk you through the signup and onboarding process that Oscar Health has. There are a few things about Oscar that I really enjoy. The overall aesthetic of the website is very clean and minimal but it’s still approachable and professional. I think they have a really great onboarding experience with perhaps a little room for improvement. During the process, the design of the whole thing feels consistent, like I’m still in the same place going after the same thing. The form still doesn’t feel like one as you move along the process. 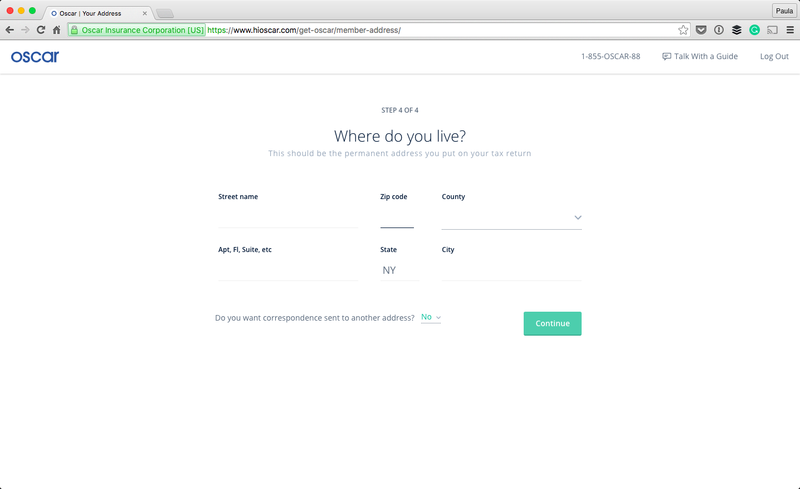 The last thing a user wants to be doing is filling out numerous forms, in any given setting. Styling the interactions not to feel like a form is a great step in making the experience not feel like a bureaucratic formality. 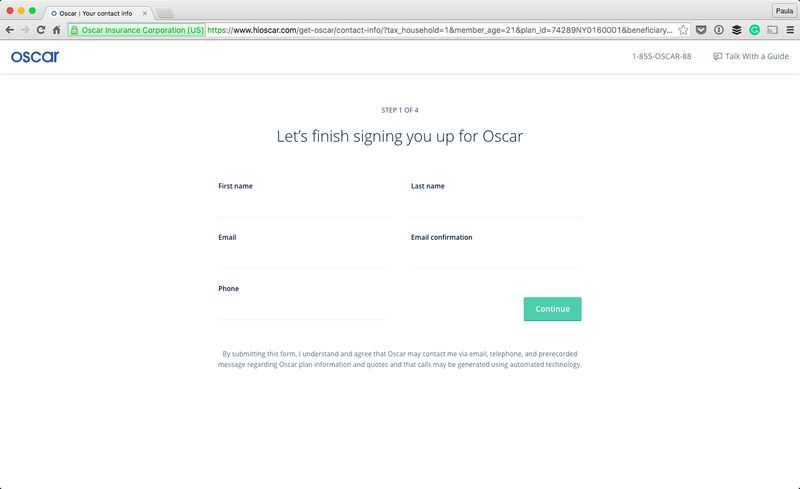 Another thing that’s very important in this sign up process is the fact that the steps are divided up, and you know where in the process you are. This further improves the form filling process. 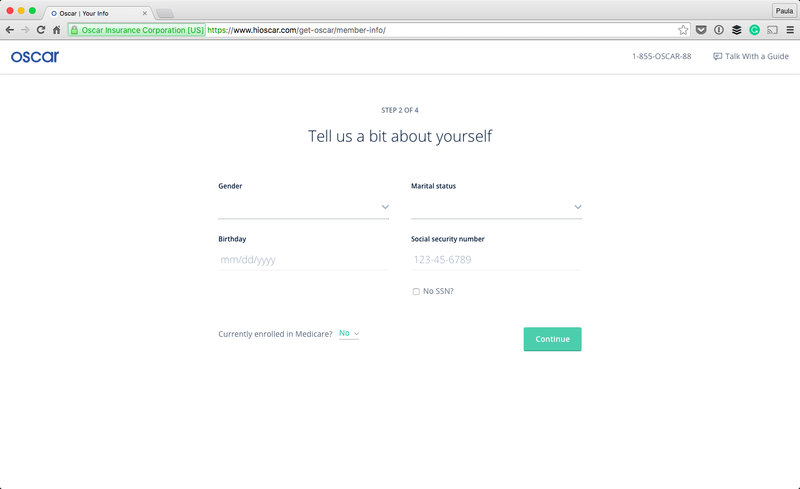 There is one thing I wish the onboarding process did more of and that’s explaining why the information is necessary. They did this in the beginning — they were transparent as to the qualifications for health insurance. But why does my gender, my phone number, or my marital status matter? 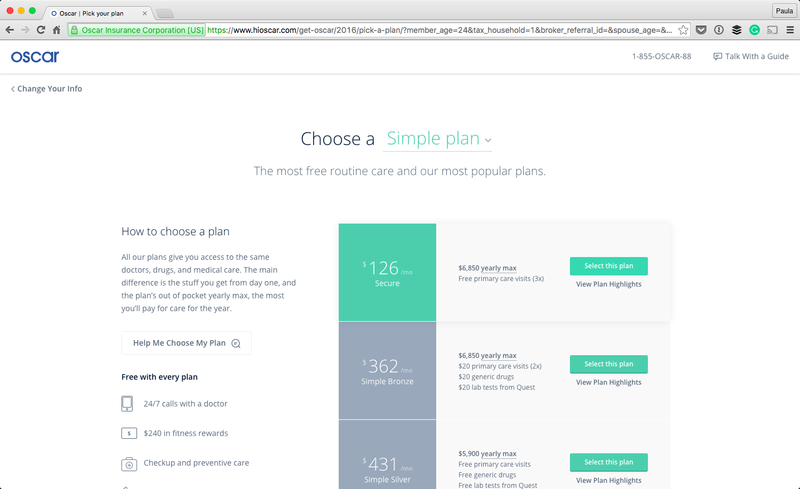 I know it somehow matters for health insurance because it’s always asked. Is that really necessary? 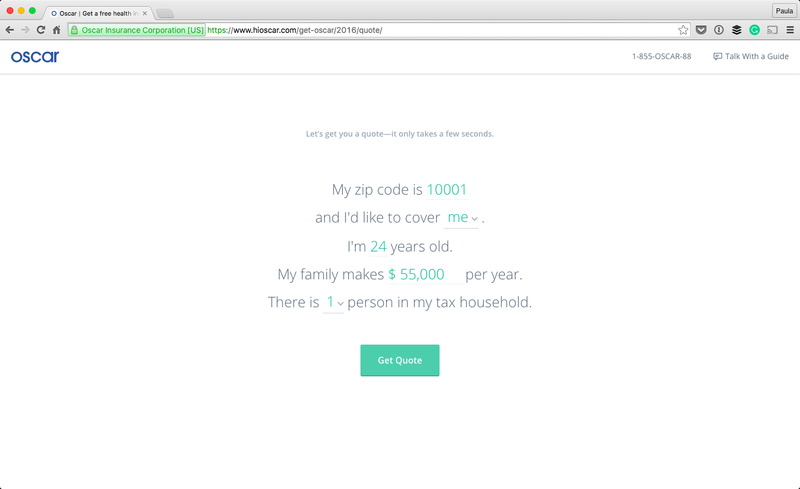 It’s pretty personal information, especially my SSN — it would put the user at ease knowing why they’re being asked for this information. Eventually, I’m asked to provide a password in order to save my information. They even say what their password formatting preferences are! (How rare is that?!) 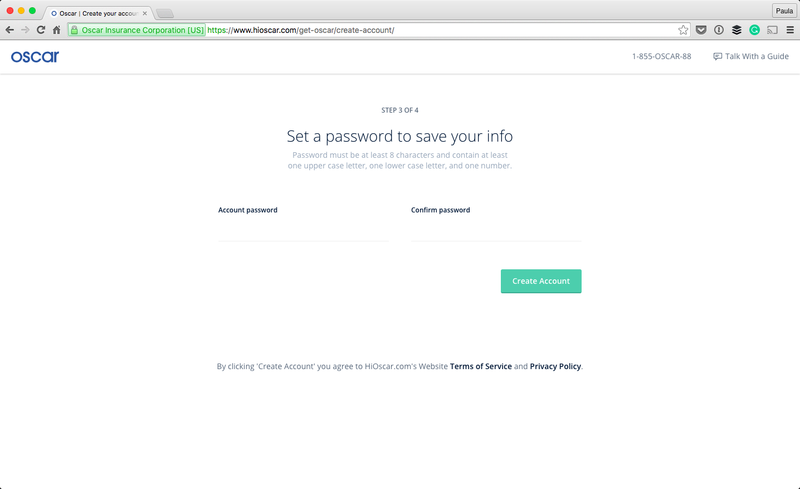 My other confusion is why the user is asked for a password before the address? It seems like the form is a little out of logical order. 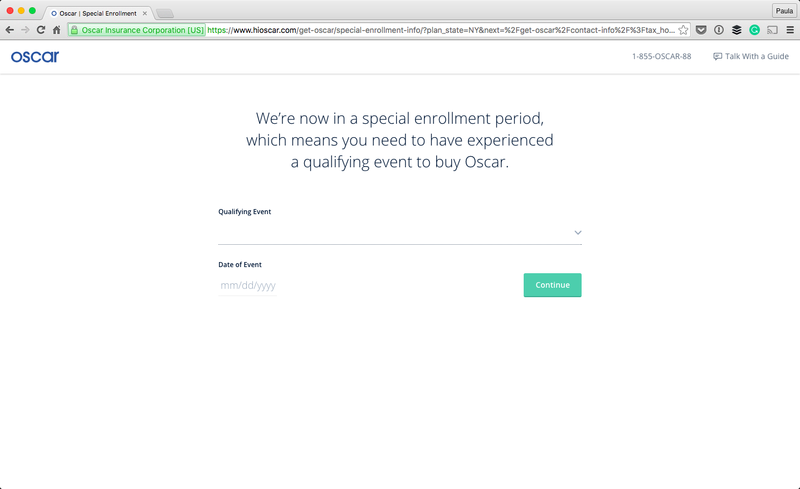 Oscar’s onboarding experience is an improvement compared to many, especially when it comes to onboarding in the healthcare industry. 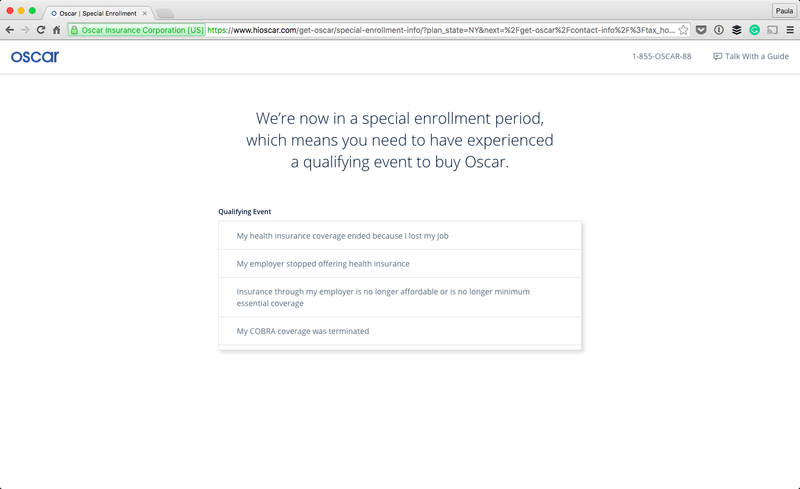 It’s obvious they care about their people, just by spending a few minutes going through their onboarding experience.